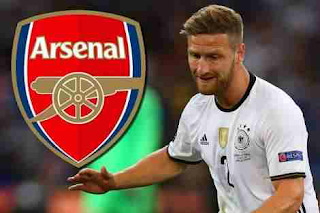 Arsenal hopes to sign German Valencia central defender Shkodran Mustafi before the summer transfer window closes, to fill the need created after the club temporarily lost its defending options to injury. Arsenal remain in negotiations with Valencia over their No1 central defensive target, Shkodran Mustafi, but there was no sign of an imminent breakthrough on Thursday night. The temperature had been turned up earlier in the day when Ali Bulut, who has a connection to Mustafi, said that the 24-year-old Germany international had agreed terms with Arsenal and all that remained to be done was for the clubs to resolve the transfer fee. There was bemusement at Arsenal and Valencia, however, with both clubs indicating that they did not believe Bulut to be Mustafi’s official agent. Valencia said the player worked only with his father and they made it clear they expected to present him at the Mestalla stadium night before their final pre-season friendly against Fiorentina. The presentation is something of a tradition. Before the game the name of each player is announced before he emerges from the tunnel to the applause of the crowd. Valencia kick off their league season at home to Las Palmas on Monday week. There is a quiet confidence at Arsenal that they will be able to get the deal for Mustafi over the line but it will not be in time for their Premier League season-opener at home to Liverpool on Sunday, in which Arsène Wenger faces a selection dilemma in central defence. Valencia appear to be in a strong negotiating position. The Spanish club know Arsenal’s need is great; that they have a vast amount of money in the bank and that time is against them. Valencia have made it plain that they value Mustafi at upwards of £25m and it is clear he is a fundamental part of their team – one that they are loth to sell. When they lost Nicolas Otamendi to Manchester City in the summer of 2015, they replaced him with Aymen Abdennour and he has struggled to find his feet. Mustafi’s importance to them has, consequently, increased. Wenger has lost Per Mertesacker and Gabriel to long-term knee and ankle injuries respectively and his other established centre-half, Laurent Koscielny, is not yet match fit after being granted an extended break following Euro 2016. Koscielny was a part of the France team that lost to Portugal in the final. Wenger will play Calum Chambers in central defence against Liverpool, alongside either Rob Holding, the 20-year-old new signing from Bolton Wanderers, or Nacho Monreal, the regular left-back. Chambers played alongside Holding in pre-season.